A review of “Where Roots and Rivers Run as Veins” in Those Who Make Us: Canadian Creature, Myth, and Monster Stories edited by Kelsi Morris and Kaitlin Tremblay (Exile, 2016). It is an incredible experience to view a story at its gestation, to be able to watch as the seeds of inspiration take root in an author’s mind. I had that opportunity when my friend Dominik Parisien visited me in Peterborough and our meanderings through the city’s woods and drumlines inspired Dominik with a story about the landscape and the relationship between people and their environment. I watched as Peterborough’s greenery inspired new ideas, led Dominik though some of the city’s history and saw resonance with ideas that were rooted in his own understanding of the world and in the stories that he needed to tell. Peterborough became fascinating through the eyes of another author, awakened from the banality that I had projected onto my home, the casual boredom that allowed me to ignore the wondrous potential of the landscape. It is fascinating how new perspectives can arise by seeing something mundane through the eyes of another, by seeing a landscape be awakened with new stories since the old ones had become so much background noise for me. Dominik Parisien wrote the epistolary story “Where Roots and Rivers Run as Veins” after our meanderings around Peterborough, and as much as it is a conversation between two women during the time of Catharine Parr Traill, this tale is also about Parisien’s own conversation with a landscape that was new to him, a reminder that we always speak with our landscapes and they always speak back. “Where Roots and Rivers Run as Veins” is a tale of people becoming part of the landscape, of an infection of leaves and bark and twigs where people become tress, growing roots into a landscape already rooted with history. It is a whispering of landscape to settlers and the need of a place not to be erased. “Where Roots and Rivers Run as Veins” is a story of awakening and transformation, a tale of the power of words to open up new understandings and new ways of communing with the landscape. It is a tale of renewal and of a landscape that won’t surrender itself to human greed or ownership. It is also a meta story that is as much about Parisien’s own conversation with the landscape of Peterborough – a sense of wonder arisen from a landscape that still needs to speak – as it is an epistolary conversation between two women who are new arrivals to the area. To find out more about Those Who Make Us, visit http://www.exileeditions.com/shop/those-who-make-us-the-exile-book-of-anthology-series-number-thirteen/. 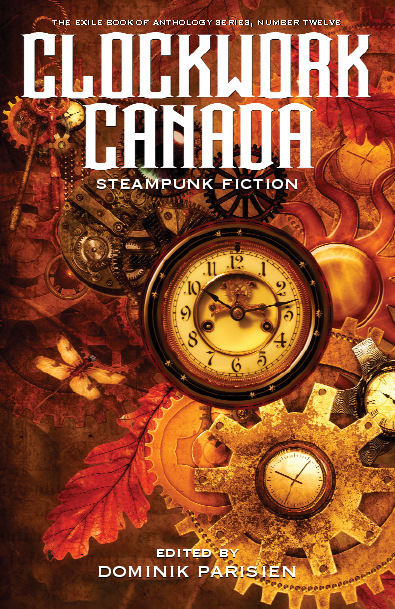 A review of Charlotte Ashley’s “La Clochemar” in Clockwork Canada: Steampunk Fiction, edited by Dominik Parisien (Exile Editions, 2016). In “La Clochemar”, Charlotte Ashley brings readers a tale of a North America filled with giant beings called the Mandimanidoo, a name that plays with the Anishinabee word for spirits “manitou”, which are alternatively spelled “manidoo”. These beings are attracted to gunpowder and pose a threat to human beings. Suzette’s role is as a runner, meant to attract the Mandimanidoo and lead them on a chase while other hunters attack the giant beings. After being attacked by a Mandimanidoo, Suzette meets Dibaabishk, an Anishinabee man who builds lifeclocks, devices capable of creating maps that illustrate where various lifeforms are located and to distinguish between these different lifeforms. Dibaabishk wants to create portable lifeclocks to allow people to navigate around the Mandimanidoo and keep safe from attacks, but the council of his people has forbidden this because they are worried that giving lifeclocks to the French settlers in the area will give those settlers the capacity to map North America and settle across the landscape while no longer needing indigenous populations to assist them. Charlotte Ashley’s “La Clochemar” brings attention to the connection between maps and colonialism, providing a method for charting the landscape and beginning the process of European settlement. Through this steampunk narrative, Ashley brings attention to the way that European settlers exploited indigenous peoples for their knowledge, taking from this knowledge and then adapting it to conquer the North American landscape. By adding the Mandimanidoo to her imagined landscape, Ashley brings attention to the fact that early European settlers used the ideology of the monstrous to Other indigenous peoples, dehumanizing them to justify colonial control and genocidal actions. The technologies created by the Anishinabee population in Charlotte Ashely’s narrative are portrayed as being in danger of European adaptation and use for racist ideological practices. Unlike many authors of steampunk, who tend to erase indigenous presence in the landscapes they imagine, Ashley creates an indigenous steampunk world that explores the collision of colonial populations and the original inhabitants of what is now called Canada, and brings attention to the exploitative patterns that colonialism set in Canada, patterns that continue to undergird the treatment of indigenous peoples. Charlotte Ashley’s tale is one of maps and claims to space, and the monsters that show up in these maps are intricately connected to the landscape, arising from features in the landscape and intrinsically connected to the idea of place. This is a tale of maps and monsters where the monsters are not the large animal-hybrid figures called the Mandimanidoo, but rather are the European settlers, the threat from without that seeks to reshape the maps for their own purposes. The third book of Nigh by Marie Bilodeau brings the reader into the realm of fairy itself, a land hostile to human life but simultaneously an object of desire. Bilodeau’s fairy realm is a land that is changeable between one moment to the next from a space of growth to a landscape of decay. It is a realm of uncertainty and this poses a problem for Al, a mechanic who always wants to know how things work and wants to take things apart and figure out the mechanisms for them to run. The fairy realm resists the very notion of being understood. It resists logic and the more Al probes into the world, the more she is met with confusion and disorientation. Bilodeau, always an author who plays with the complexity and power of stories to shape human lives, explains the history of telling fairy tales as a way for human beings to prepare later generations for the experience of entering into the fairy realm. She plays with the notion of speculation as a way of understanding another reality and suggests that story-telling has historically been a survival mechanism for human contact with other realms. In this way, Marie Bilodeau invites us to question the way story-telling tells us about our own world, about ourselves, and about the way we understand our relationship to the world. Nigh Book 3 plays with the landscape in a unique way, experimenting with a question that Northrop Frye suggests much of Canadian literature deals with: “Where is here?” The fairy realm represents a space entirely defined by uncertainty. The uncertainty of the fairy landscape is not divorced from human responsibility. We are partially responsible for that shifted, changed, hostile landscape where the fairies have dwelled. We are told by the fairies that human actions have fragmented the fairy world and that damage and changes to our environment have meant that the fairy worlds (parallel to our own) have been torn apart, families ripped asunder. The altering of our world has similarly altered and changed the realm that has become harmful to us. In this third book of Nigh, Bilodeau gives context to the fairies, greying their morality instead of presenting them as entirely ‘evil’. The fairypocalypse is made more complex by adding the complexities of fairy voices to the experience, giving them the opportunity to explain their position and challenge that view of them as entirely other to human experienc eand hostile to human existence. The human presence in the fairy landscape is marked by loss, by a change so hostile to humanity that the human beings themselves begin to slip away, losing elements of their identity. While in the fairy world, characters experience the infiltration into their bodies of difference, strangeness, and, in some cases, the loss of memory and selfhood. Bilodeau’s characters are need to question their identity, their memories, and the things that make them who they are as they submerge into a strange, foriegn, and hostile land. In Nigh book 3 Marie Bilodeau examines our complex relationship to our landscapes and the way that our environment changes and alters us. A Review of Jon Stables’ Brok Windsor. Edited by Hope Nicholson (Bedside Press, 2015). What sort of vehicle would a Canadian superhero adventurer from the mid 1940s travel in? That’s right, of course it is a canoe. Comic book superhero Brok Windsor was a creation of Jon Stables, writing under the pseudonym Jon St. Ables. The Brok Windsor comics, like most golden age Canadian comics, were produced during the years around world war II when Canadian rationing laws meant that American comics were no longer being shipped to Canada. Stables and his contemporaries were able to create their own Canadian superheroes and rewrite the Canadian landscape as a place of adventure. The Brok Windsor comics ran from 1944-1946 and was produced by Maple Leaf Publications. Hope Nicholson has now resurrected this historical comic and published it as a collection through Bedside Press. But where is a Canadian adventurer like Brok Windsor to find adventure in this Canadian landscape?… well, don’t forget that Canada is huge, and, of course, most of the country is largely unexplored, so when Windsor is fishing in his canoe and sees strange mists on a large lake named “The Lake of the Woods”, of course he needs to investigate. Through the misty barrier, Windsor finds himself in a new realm of islands, and, as we know, islands are always places of mystery and adventure. Jon Stables’ Brok Windsor comics were about the immensity of the Canadian landscape and its ability to be both familiar and strange, a place that can be opened to adventure and whose magical quality is only a thin wall of mists away. Windsor’s body itself is shaped by his landscape and when he crosses through the mists he becomes immense in size, his body emulating the bodies of the giants who occupy these islands of adventure, and, even when his body is returned to its normal size, the intrinsic difference is still written on his body, providing him with the immensity of strength that his giant body possessed… just in the form of a smaller, more Canadian shape. The oddity and magical quality of this different landscape hidden within Canada’s hugeness is expressed throughout the comics. Even seemingly familiar aspects of the landscape are alive with oddity. When Brok first encounters trees in this landscape, rather than providing a sense of familiarity, they add to the oddity of the landscape. Rather than stationary figures of the landscape, these trees are active and potentially consumptive, reaching out with branched fingers to consume flesh. Through this device Stables illustrates the oddity of the landscape and the notion that the expectations of Canadian geography are about to be disrupted. Brok Windsor encounters new civilizations, alien lifeforms who are able to detach their heads from their bodies, possessing spirits, gigantic bird-bats, horned lions, insectile people who are horrified by water, magnetically powered flying cars, and an indigenous civilization that has become giant and have developed space-age technology. Windsor’s companion in this strange world is one of the giant indigenous men that he has encountered, Torgon, who serves as a translator for the adventurer as well as a co-explorer in a realm of new possibilities. Stables’ art evokes the mystical quality of the Canadian landscape, the power of sky, lake, and treescape that were frequently evoked by Canadians trying to find a sense of identity in the war years and served as a shorthand for belonging. The power of Stables’ art is such that it is able to evoke both these familiar shorthands for Canadian geographical ideas of belonging and also estrange these icons of belonging by creating a strange landscape within the expectedly familiar place. To discover more about Hope Nicholson’s reprint of the Brok Windsor comics, visit https://www.kickstarter.com/projects/hopelnicholson/brok-windsor-lost-wwii-comic-book-returns/video_share . We are shaped by what we eat, by what we consume and Nalo Hopkinson’s “Slow Cold Chick” is an examination of the relationship between food, identity, and selfhood. Food is transformative. When Blaise finds rotting eggs and rotting hot sauce in her fridge and throws them out, but rotting is a process of transformation itself and the interaction of rotten egg and hot sauce breathes new life into the rotting fetus. A cockatrice is formed, with blazing eyes and incredible hunger. Like the hot sauce, the cockatrice is all fire – anger, heat and desire. The cockatrice needs to eat and whenever it consumes something, it takes on the characteristics of its food, altering and changing to incorporate elements of its food into itself. Blaise also discovers that food shapes her neighbours, that the woman next door who reminds her of prehistoric Venus figurines eats flower petals and her stony companion eats raw earth, both of them taking on qualities of their chosen food. Food can remind us of home and it can connect us to the landscape by providing us with nourishment from the locales where we collect it. Blaise, like her neighbours and the cockatrice that makes its home with her, is shaped by the foods she eats and her connection to the landscape. Eating allows her to connect with that part of herself that she has closed off, that she has alienated herself from, and the act of eating allows her to connect to parts of herself that she has denied: her desires, heat, anger, and passion.